CANCELATION NOTICE: We regret to announce that the Duo Lazzeri-Leonardi concert has been canceled due to a hand injury of Sandro Lazzeri. We wish Sandro a speedy recovery and hope to have them visit us in the future. This concert is now replaced by Edel Munõz Concert at the same time. Tickets that were already sold may be used for this replacement concert or refunded by request. 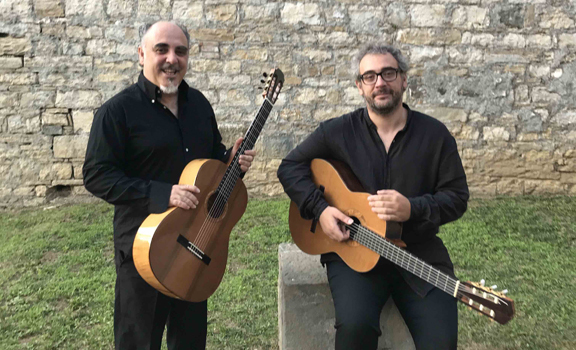 The Miami International GuitART Festival presents award-winning the Duo Lazzeri-Leonardi with Italian guitarists Sandro Lazzeri and Emiliano Leonardi, performing a program of duo works by Leo Brouwer, Joaquin Rodrigo, Ferdinando Carulli, Fernando Sor, Johannes Brahms, Isaac Albeniz, Manuel de Falla, and Mesut Ozgen.